An all-purpose field knife is the foundation of any outdoorsman’s gear. A cutting edge is among humanity’s earliest manufactured tools, and for good reason. With the ability to cut, scrape, score, and gouge, a human being can manipulate the world around him, facilitating both his short-term survival and his long-term prosperity. The knife, therefore, is fundamental to survival, both in emergencies and in an ongoing sense. It was with this in mind that Mike Wallace designed the SPEAR series, the acronym for which stands for Self-Preserve, Evolve, Adapt, Rescue. The SPEAR 1 is 11-1/8 inches overall with a 5-1/2 inch blade (set at an ergonomic and functional angle). The A2 steel in the prototype is 3/16-inch think, which means the knife weighs in at 12 ounces. It features an extended steel pommel that can serve as a small prybar and scraper. The prototype also includes a .38 and .357 Magnum caliber bullet-puller hole. Mike’s original concept was to offer different calibers of bullet pullers at customer request, the idea being to pull the bullet from a round you were carrying so the gunpowder inside the cartridge could be used for fire-starting. “The bullet puller will probably be omitted,” Mike told us of future “production” versions of the knife. Another feature that Mike will continue to include on the SPEAR 1 is the concave copper disc in the handle. This is his “pyro-plug,” which serves as the top bearing of a fire-bow drill. For those who want a slightly easier way to get their tinder going, the sheath of our prototype included a slot for a 3/8-inch ferrocerium fire-starting rod. While one wasn’t included, I had several on hand, and found that the loop retains the rod securely. The SPEAR 1 began life as a sketch depicting a fixed blade with a squared spine, thumb jimping, and forward cant to the blade to aid in chopping. That’s precisely what the SPEAR 1 became. The nice, deep, and well-finished jimping forward and behind the guard provides great purchase for the thumb, while the remainder of the handle is smooth to prevent fatigue (by creating maximum comfort) during frequent chopping. The point of balance is in the rear half of the index finger scallop, right where it should be. I find the handle extremely comfortable. While I have large hands, I think those with smaller hands would find it comfortable as well. The knife is a great chopper and I hacked my way through brush, small limbs, and even chopped some divots out of larger pieces of wood, all with relative ease. While Mike himself doesn’t prefer the extended pommel, I found it useful for hammering (if your goal is simply to do damage, not drive a nail), prying, and scraping. The nice big blade never feels too big, but it certainly isn’t too small, which means the SPEAR 1 handled plenty of big jobs around my brother’s rural farm property without difficulty. I used it to cut broad sections of canvas, to slice up heavy (and empty) chemical barrels, and to cut kindling and cordage. Edge holding was good. When it finally started to get dull, I touched it up on a diamond rod and it went right back to work. If I had anything I might wish for where the SPEAR 1 is concerned, I might wish an additional sheath option. The factory sheath is absolutely beautiful, holds the knife securely, and exhibits good craftsmanship. If someone were to give me the opportunity, though, I would love to have a second sheath, or an add-on strap of some kind, that would allow me to carry the knife horizontally. As it stands, you can rig up something fairly substantial with paracord if you choose. I absolutely love the SPEAR 1. The canted blade and the contour of the handle makes it a very comfortable, functional cutter and chopper, while the attention to detail and the consistently fine workmanship exhibited by Mike Wallace knives means this knife will give years of faithful service. When you are looking for a bushcraft blade in either Nessmuk or clip point blade patterns, Mike Wallace’s SPEAR series is an excellent choice. The fact the knives are attractive to look at and pleasing to heft and use is just an additional bonus. As a boy, I first learned about the concept of the “survival knife” from the “Rambo” movies, as did so many children of the 1980s. Fourteen-year-old me was very concerned about the threat presented by ninja stars, too. As you can imagine, my assessment of the utility of a survival knife, hollow-handle or otherwise, was not terribly accurate. Nonetheless, indelibly printed on my mind from my preteens was the notion that a large, sturdy knife is very useful when in the field. Whether your needs are for hunting, bushcraft, survivalism and prepping, or even self-defense, a large blade is de rigueur. But what makes a good field knife? What qualities should it have? 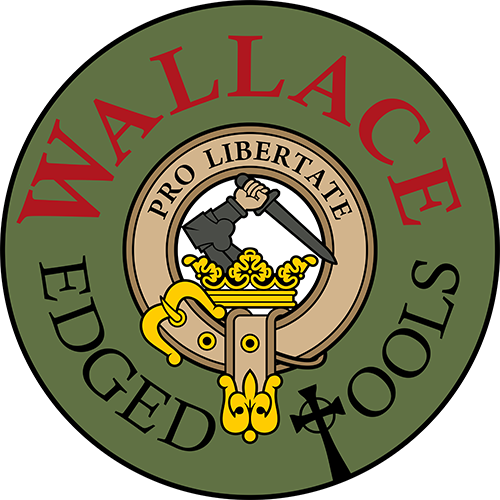 The SPEAR series from Mike Wallace is a line of field knives that, individually and as a product line, tackle this question. In this case, SPEAR stands for Self-Preserve, Evolve, Adapt, Rescue. The SPEAR 2 prototype featured here is eleven inches overall and weighs 14 ounces. My version shipped with a gorgeous hand-tooled leather sheath, as do all of Mike’s knives, this one with a loop for a 3/8-inch ferro rod. I bought a couple of suitable rods recently, so it was a moment’s effort to slip one of the rods into its waiting sheath loop, where it is firmly secured and ready for any fire-starting needs that arise. This seems like a small thing, but it’s actually very noteworthy, because so many of the “survival” blades you buy today come with ferrocerium rods but have no place to put them. If the sheath doesn’t have a carrying spot for the rod, it’s just going to get lost, and therefore won’t be there when you need it. Ferrocerium, if you’re not aware, is a synthetic material that produces sparks when metal, such as a knife blade, is scraped across it. It is therefore very useful for starting fires when sparking tinder. While you’re much better off carrying a Bic lighter as part of your survival gear, a ferro rod will never run out of fluid, rust shut, or otherwise stop working. Following the “two is one and one is none” rule of survival gear, the rod is a great backup to a more convenient fire-starting method like a lighter. This is a substantial field blade with G10 handle scales, brass or copper tubes (the customer may specify his or her preference) and a lanyard. Blade steel is 0.190-inch thick CPM 3V. The blade measures out to 5-5/8 inches long with a five-inch cutting edge. My prototype was razor sharp out of the box – Mike sharpened it himself, so I wouldn’t expect any different– and has a wide drop-point blade with a pronounced choil and a considerable integral guard. Grooves along the full tang, together with the texture of the G10, ensure an excellent grip, while my thumb and index finger naturally fall into the ergonomic contours below the guard. The choil has a scallop opposite it on the blade spine that allows the user to brace his thumb and choke up for fine work. The broad drop-point blade is a good choice for field chores. While a bit thick and heavy for dressing game, the knife can still perform this task, and shines when it comes time to chop (whether you’re butchering or building an improvised shelter). The point of balance is right where the Mike Wallace shield in the handle meets the ergonomic scallops below the guard — in other words, right where it should be to make the knife a well-balanced field blade that is also a natural chopper. Against a blighted Upstate New York landscape whose residents are still recovering from one of the most brutal winters in recent memory, the SPEAR 2 easily tackled all of the field chores I threw at it, including making kindling, chopping small tree limbs, and even some digging and prying (which always constitutes abuse of a knife, but which may be necessary in a true survival or wilderness emergency scenario). It displays good edge holding and could be used for food prep (after a good cleaning) as easily as for more “rough” tasks. One of the more unique features of the SPEAR 2, shared by its sibling the SPEAR 1, is a concave copper disc set in the handle. This is a “pyro-plug,” which serves as the top bearing for a fire bow. You’ve seen this in use before: A piece of wood is rotated at high speed using a bow to create fiction and ignite tinder. The process requires a means of bracing the rotating wood while allowing it to move. Mike’s pyro-plug makes this easy and eliminates a step in the process (the step in which a wood block would need to be prepared for this purpose). The SPEAR 2 would make an excellent choice as the foundation for an all-purpose field or survival kit. It is also a great belt knife for any hunter or outdoorsman. It is large enough to handle big jobs while not being so large as to become unwieldy when dealing with finer work. Overall fit and finish is, as with all Mike Wallace knives, absolutely beautiful. The knife exhibits good attention to detail, excellent craftsmanship, and understated, attractive aesthetics. If you know you want an outdoor task knife but you’re not entirely certain what you will be using it for, the SPEAR 2 is a great way to hedge your bets.